To get an ippon or to win in kendo you need “heart”, “skill” and “physique”. Only when these are all combined can you gain ippon. Regarding the “heart”, it’s about having a still mind, or to concentrate on the match. In order to concentrate better and to get your spirit up during the match, you make the calls. And you plan in your mind how you are going to gain ippon against your opponent. Regarding “skill”, you try to exhibit all the skills you have acquired in your daily training. 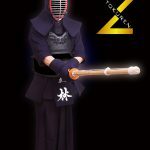 For “physique”, as you repeat the moves of “men” (face) “kote” (gloves) “dou” (body) and “tsuki” (thrust), be mindful of your posture and your position, and make sure that your kendo gear does not come off during the match. Overall, you start from a crouching position, then when you stand up and take your position, the tip of your sword should be pointing upward about 10-15 cm away from the tip of your opponent’s sword. This means your sword is point to your opponent’s throat. 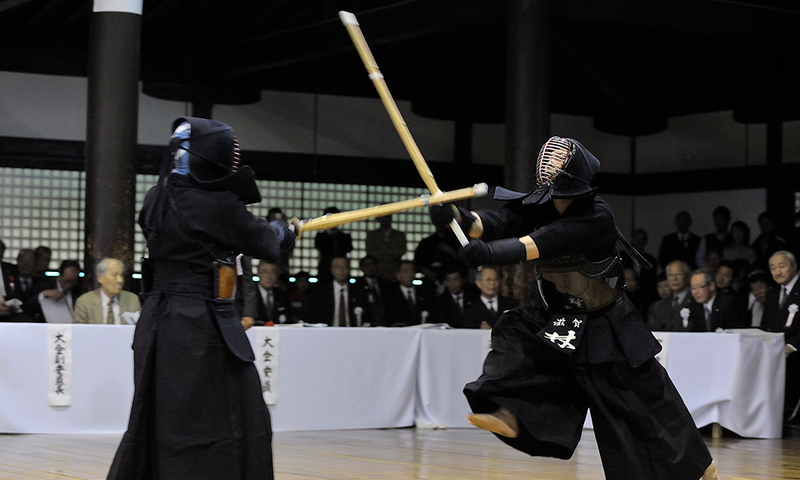 This is called “ma’ai” in kendo, meaning “space”. 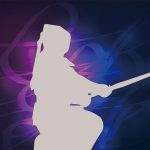 While creating your own space, you motivate yourself, and while avoiding your opponent’s sword you gradually eliminate the “ma’ai” until you can strike your own blow. In this moment, if you are mindful of your opponent’s breathing and the slight wavering of the edge of the sword, you can catch a single moment of lapse in concentration and do your own men, kote, do, and tsuki, you can win ippon. 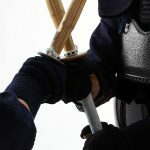 Even when the swords are locked against each other, if you can catch your opponent breathing with the shoulders and other momentary lapses, you can create your own “ma’ai” and do hiki-men, hiki-kote and hiki-do (hiki means to pull back). A combination of kiai (motivation), fumikomi (stepping in) and uchigatana (striking) can win ippon. Another thing you should be mindful of is that your posture is correct, as well as your mentality. Firstly, the basic posture when standing is the middle guard. From your back to your head and from your hips to your feet, imaging a single bamboo tree standing straight. Try not to stoop or bend upwards. Pull your chin in and imaging your head being hung by a string from atop. Hold this posture and imaging your balance point to be below your belly button. With other postures such as the upper guard, lower guard, or the hasso guard, if you are mindful of the above points you can keep a neat posture. 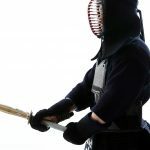 During matches, when you do hiki-men, hiki-kote or hiki-do, people often pull their heads back and their hips tend to bend forward, but it is important to keep your posture bearing the above points in mind. When retreating, try imaging a triangle from the center of your back to both shoulders, and maintaining that while you retreat. About the mindset, “it begins and ends with manners (bowing)” is a common saying. The bowing posture is created by lowing your upper body from your waist at about a 35-40 degree angle. While bowing for about 3 seconds, your eyes should be fixed on the floor in front. 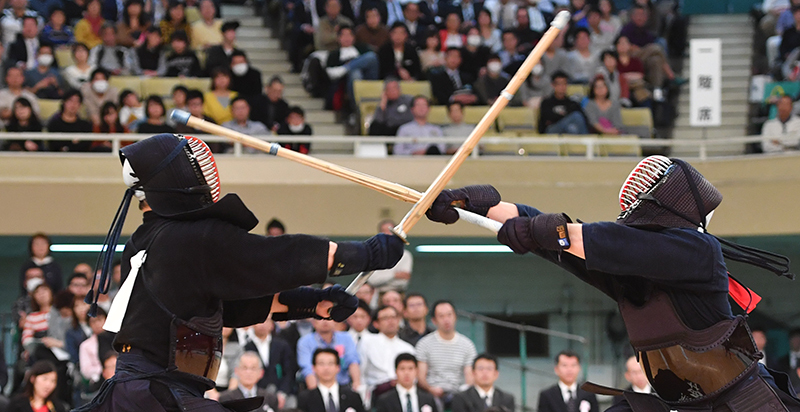 For matches, you look the opponent in the eyes and bow – the bow says to the opponent “I will fight to the best of my abilities” and “thank you for being my opponent”. The bowing after the match says “thank you for the match” regardless of the outcome. 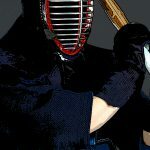 This is the beauty of kendo.